IN SUPER CONDITION LEATHER LINED EXPENSIVE WHEN NEW. Clarks Loafers. Green & Tan. In very Good Used Condition. Clean & Sanitised. SIZE 9 (43) CLARKS BLACK LEATHER SHOES. 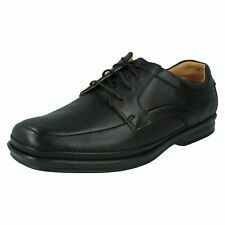 MENS CLARKS BLACK LEATHER SHOES SIZE 8. SLIP ON COMFORT. SIZE UK 9.5. STANDARD FIT. Black slip resistant textured 'rubber' sole. Soft leather lining. Leather insole, Lightweight, flexible, breathable, quick drying, supportive. Lots more Duplo for Sale. Uppers High front with hidden elastic across instep & stitched front. Great, comfortable shoes, no problems to report! CLARKS Keeler Walk. Padded collars, 'Cushion Soft' and 'Ortholite' technologies are built-in for protection and comfort. Hardly worn so in excellent condition, like new. - Uppers: Leather. - Outer Material: Leather. Clarks flex light mens shoes brown leather touch velcro fastening uk 7.5 . Touch Velcro fastening. Brown leather. Breathable leather lining. COMFORT SHOES. SIZE UK 9.5. VERY GOOD CONDITION. 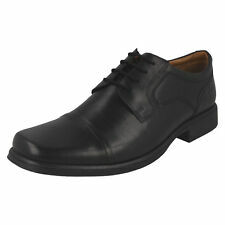 Men's Clark's leather casual shoe. UK 7. Smart office. Casual.